During the summer of 2003 when I was out of work I happened to call into Hewitt's shop in Monkstown while out for a walk. This is not a bookshop, but I noticed a book on the counter with the curious title "that could never be". 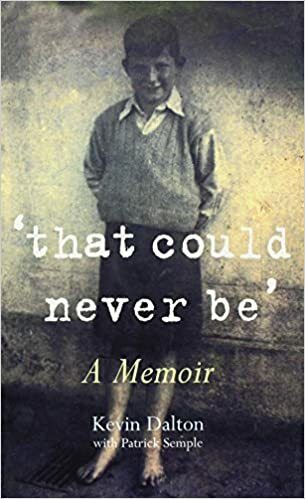 It was a memoir of Reverend Kevin Dalton, then Rector at Monkstown Parish Church. I had never met him or even knew of his existence, though I was possibly at a ceremony or two at funeral in his church. I noticed that the book was signed by the author and if I recall correctly I was told that the profits of the book went to parish funds. I bought it, brought it home, put it on a shelf intending to read it, but never got around to it. Recently I came across it and decided to read it almost 13 years after buying it. Dalton was an orphan who grew up in Protestant schools, from an early age he wanted to be ordained. His life is interesting, though nothing special or too much out of the ordinary. He did benefit hugely from people who helped him financially while growing up and when he was studying to be a vicar - he had very generous friends. There are no stories of abuse in the schools he was in, though he does paint a tough picture of life as an orphan. The most interesting part of the book is about his time as a clergyman and how he dealt with parishioners. Most stories are very short and end up the same - the problem never happened again. The book is short (192 pages) and is easy to read - it was written by Patrick Semple. Don't expect any revelations or daring deeds - this is quite an ordinary memoir. I remember Kevin Dalton as a curate in Stillorgan. I knew something of his background but never knew he wrote a book.